Marcus Theatres®, a division of The Marcus Corporation (NYSE:MCS), today announced that this year it will be enhancing the moviegoing experience at six of the 14 properties it acquired from Wehrenberg Theatres in December 2016. DreamLounger¿ recliner seating will be installed at Marcus Wehrenberg Cape West (Cape Girardeau), Chesterfield, Des Peres and Ronnie's (St. Louis) in Missouri, and Bloomington and O'Fallon Cines in Illinois. In addition, four of these locations will add at least one new food and beverage concept and three will receive a Marcus signature premium large format screen (PLF). Future enhancements are already being planned for other acquired locations as well. "It is important that we continue to provide the community the ultimate destination for moviegoing," said Rolando Rodriguez, chairman, president and chief executive officer of Marcus Theatres. "DreamLounger recliners are one of the most popular amenities throughout our circuit. Adding these seats to six theatres will provide guests the comforts of home while at the movies. We are excited to hear the community's reaction to the investments we are making, which will help create a more comprehensive entertainment experience all under one roof." Current renovations are in various stages across the six locations, but they begin with the addition of DreamLoungers to all non-IMAX ® auditoriums. 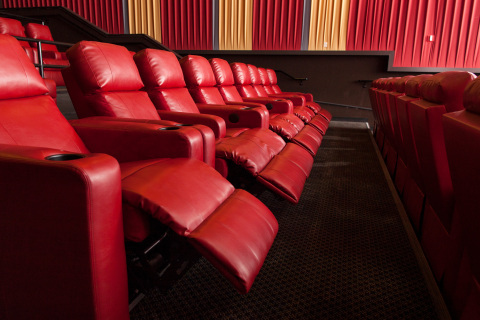 Although a few are still under construction, every open auditorium at Ronnie's Cine currently features the recliner seating, while Bloomington, Cape West and Chesterfield Cines began their renovations in July and Des Peres and O'Fallon are soon to be under construction. Feedback suggests that guests enjoy the comfort of DreamLounger recliners and appreciate double the legroom between rows and the ability to go from a seated upright position to a full recline with the touch of a button. Plus, reserved seating provides a convenient, stress-free experience — with free online ticketing for Magical Movie Rewards¿ members. Three properties also will receive a PLF screen — another popular amenity now at nearly 60 percent of locations throughout the company's circuit. The MegaScreen at Chesterfield will be transformed into an UltraScreen DLX ® auditorium, which features a massive screen, DreamLounger recliners and Dolby ® Atmos ® multidimensional sound with speakers along the front, back, sides and ceiling of the room. Cape West and Ronnie's Cines will each receive one SuperScreen DLX ® auditorium, complete with DreamLounger seating, oversized screens, and immersive Dolby ® Atmos ® sound. All PLF auditoriums will feature heated recliner seating, which can be turned on or off with the simple push of a button. Take Five Lounge¿ brings a casual dining, appetizer and beverage option to Marcus Theatres. Guests can relax over food and drinks before and after a movie, adding to their evening out at the theatre. Plus, beverages can be brought into auditoriums for customers to enjoy during the movie. Take Five Lounge additions are planned for Ronnie's, Cape West, Des Peres and O'Fallon Cines. Reel Sizzle ® is the newest food concept from Marcus Theatres. It serves up menu items inspired by classic Hollywood and the iconic diners of the 1950s. Americana fare like burgers, chicken tenders, crinkle cut fries with 'sizzle seasoning' and signature shakes, are prepared on a griddle behind the counter. Two Reel Sizzles are planned as part of these renovations - one at Ronnie's and one at O'Fallon Cine. Zaffiro's¿ Express is a concept that allows guests to place their order at a counter area for quick pick-up. Zaffiro's Express is known for its Thincredible ® handmade pizza, but also offers sandwiches, appetizers, desserts and other menu items. These can be enjoyed in the lobby or can be taken into the auditorium as a perfect meal with the movie. Based on an iconic award-winning Milwaukee pizzeria, Zaffiro's Express is coming soon to Cape West, Des Peres and Ronnie's Cines. Big Screen Bistros¿ offer full-service, in-theatre dining with a complete menu of entrees, appetizers, salads, sandwiches, desserts and drinks. Guests place their order with wait staff and their food and beverages will be delivered right to their seats. Des Peres Cine will feature three Big Screen Bistro auditoriums following completion of the remodel. Headquartered in Milwaukee, Wisconsin, The Marcus Corporation is a leader in the lodging and entertainment industries, with significant company-owned real estate assets. In addition to its Marcus Theatres division, its lodging division, Marcus® Hotels & Resorts, owns and/or manages 17 hotels, resorts and other properties in nine states. For more information, please visit the company's website at www.marcuscorp.com .